Talking Tape-in Hair Extensions with Trü on Park! Have you ever considered getting hair extensions? Whether you want to add length, volume, color, or all the above, there’s a lot of things to consider! Where should you go to get hair extensions in Rochester? Which type of hair extension system is best for you? What do you need to know before investing in your own hair extensions? Here at Trü on Park, we use the VoMor hair extension system. Exclusive to Aveda salons, this unique system stands apart from your average beauty supply store hair extensions. What makes VoMor so special? The hair extensions are made from 100% cuticle-intact Remy hair, meaning they are non-synthetic and can be blow-dried, styled, and worn just like your natural hair. These extensions are tape-in and reusable. They must be applied and removed in-salon by VoMor certified stylists and will be reconditioned in-between wears. Most guests can get over a year’s worth of use out of their first box of hair! Depending on how quickly your hair grows, recommended wear of tape-in extensions is 6-8 weeks. We strongly suggest scheduling your removal and recondition at the time application so you have nothing to worry about! VoMor utilizes surgical-grade adhesive in their tape, so your hair extensions will stay securely in place until it is time to have your licensed stylist remove them. There will be no twisting, pinching, or uncomfortable bunching of the bonds. We’ve laid out the technical details, but what about the fun stuff? Are your style options limited? Not at all! VoMor tape-in extensions come in three different lengths: 12, 16, and 20 inches. You and your stylist will work together to determine which length is best for you. Additionally, you will never have to worry about finding the right color hair extensions again! VoMor comes in 30 colors ranging from icy blonde to rich black, with many shades in between. Your perfect match is waiting. Ready to see what all the hype is about? Trü on Park requires a complimentary consultation prior to a hair extension application to determine the best course of action for you and your stylist can answer any questions you may have. 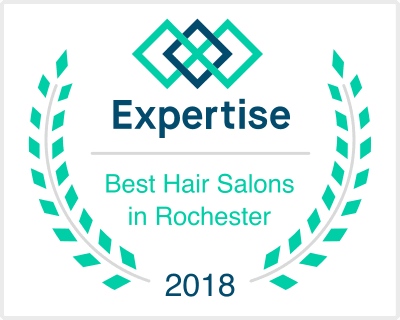 We hope you are excited to try the best hair extensions in Rochester, NY! Call or email us to book your VoMor consultation today!